Is there a way to preview my app that I am building? At the top of the app designer page, you will find a button called ‘Preview App’ at the top of the app designer page. This is the easiest way to view a preview of what the app you are building will look like and how it will function on the web app. 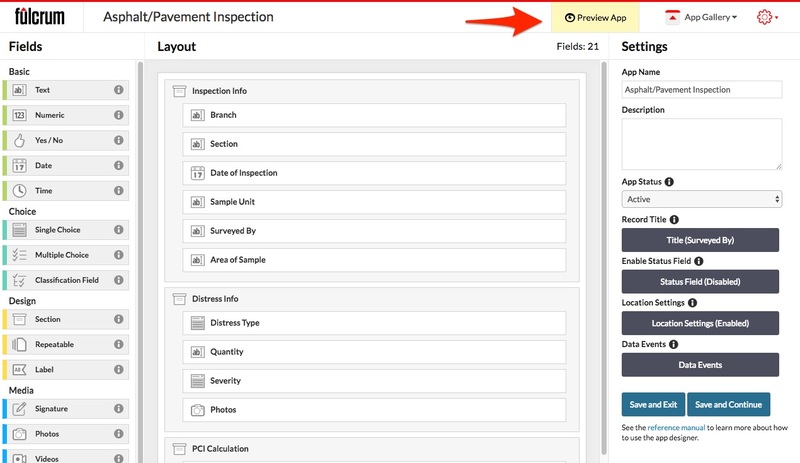 This allows you to test workflows and logic without ever having to leave the app designer page. While the preview option can be very useful for testing, there are some nuances between the web app's record editor and the mobile apps' record editors. As a result of this we recommend conducting tests on the Fulcrum mobile apps with as close to live data as possible. This will help ensure you get the closest experience that your field team will have as possible. Note: You will not create any actual records through the preview app button.